The Asus PadFone X for AT&T is the Taiwanese manufacturer's first offering from the family of hybrid devices to officially hit the US market. Announced during this year's CES in Las Vegas, the device consists of a high-end Android handset and a tablet docking station with 9" IPS display and stereo speakers. At a quick glance, the Asus PadFone X could well be the dream device for an Android power user. Thanks to the combination of Snapdragon 800 SoC, 13MP camera with 4K recording, and 5" 1080p Super IPS+ display, the handset can rub shoulders with most high-end offerings out there. The bundled docking station on the other hand, will surely appeal to the budget-minded, as no competitor offers such functionality for the price. To top things off, the optional full keyboard cover will transform the device into a capable compact notebook. By the looks of it, as far as available features go, the Asus PadFone X is anything but lacking. The device packs a powerful chipset, a top-notch display, and capable camera, topped by an Android KitKat build with useful additions from Asus. 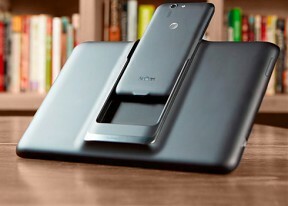 The bundled tablet dock is what truly separates the Asus PadFone X apart from its competitors. Available out of the box at no additional cost, the docking station is certain to make the PadFone X a mighty attractive option for those who cannot shell out additional cash for a tablet. However, as is the case with many devices that try to offer multiple talents, the Asus PadFone X is not exactly perfect in all departments. The handset is hardly one of the best looking in its segment to begin with. The tablet dock has also seen some engineering compromises as it's bulky in size and has wide screen bezels. As always, we will kick our review off with an unboxing of the Asus PadFone X, followed by a design and build quality inspection. did you go to m.i.t.? too smart! When will this come to T-Mobile?